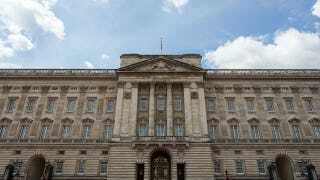 The Queen might have to pack up and relocate from Buckingham Palace—temporarily, anyway, because the old pile apparently needs millions and millions of dollars worth of renovations. Frankly, the place sounds like a dump. The Associated Press says the joint hasn’t really been redecorated since the early 1950s, when Elizabeth first wore the crown. We’re not just talking tacky wallpaper and shabby carpets, though: “Officials say the palace needs an estimated 150 million pounds ($237 million) of renovation and upgrades, including replacing old plumbing and wiring and removing asbestos.” Queen Victoria was the first monarch who actually lived in Buckingham Palace, but bits and pieces are even older. One shudders to contemplate the shitters. But it’s downright cheap compared to proposed renovations to the palace of Westminster, where Parliament meets. The Guardian points out that’s been estimated to cost a whopping £3 billion. I tell you, they just don’t make them like the Normans did anymore.